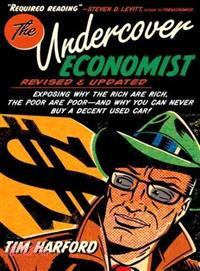 With over one million copies sold, The Undercover Economist has been hailed worldwide as a fantastic guide to the fundamental principles of economics. An economist's version of The Way Things Work, this engaging volume is part Economics 101 and part expose of the economic principles lurking behind daily events, explaining everything from traffic jams to high coffee prices. This revised edition, newly updated to consider the banking crisis and economic turbulence of the last four years, is essential for anyone who has wondered why the gap between rich and poor nations is so great, or why they can't seem to find a decent second-hand car, or how to outwit Starbucks. Senior columnist for the Financial Times Tim Harford brings his experience and insight to bear as he ranges from Africa, Asia, Europe, and the United States to reveal how supermarkets, airlines, and coffee chains--to name just a few--are vacuuming money from our wallets. Harford punctures the myths surrounding some of today's biggest controversies, including the high cost of health-care; he reveals why certain environmental laws can put a smile on a landlord's face; and he explains why some industries can have high profits for innocent reasons, while in other industries something sinister is going on. Covering an array of economic concepts including scarce resources, market power, efficiency, price gouging, market failure, inside information, and game theory, Harford sheds light on how these forces shape our day-to-day lives, often without our knowing it. Tim Harford is a senior columnist for the Financial Times and author of several books. He is a visiting fellow at Nuffield College, Oxford, a senior visiting fellow at Cass Business School, and he lives in Oxford with his wife and three children.